Within the last week, a couple of projects made it to the Internet. One of them includes Canyon Gate Marketing. This company is integrated with relationships into the other sites I have been working on as a part of my job. This does not include side projects outside of trnxs.net. Here is the before and after. 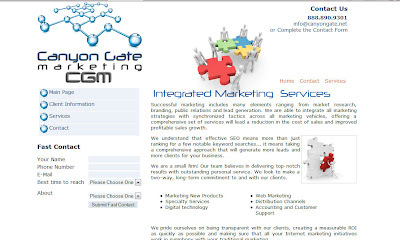 The mission of Canyon Gate Marketing became better defined and the CEO of the company strengthened his vision. Although the company has been around for a while it is putting new light on its current and future projects. Glad to be a part of it. On a side note… I was working on a couple of StudioSK specific projects including gotNurv.com and a new site. Although I am concerned about posting this on here because of the nature of the content, the site itself is highly worthy. 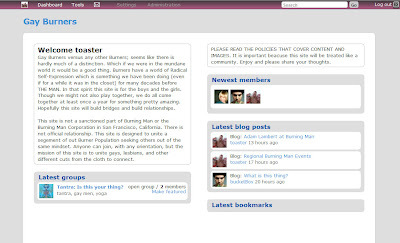 Modifications/Customizations went fairly well and I proposed this to another person whom I know is trying to build a social networking environment. I used Eelg as opposed to other products a lot of developers are using as framework out there. My user group will be discussing these next week at a meeting atBorders in the Towne Center Square on the 13th.